Summer brings on good times. We spend more time outside in the summer. We get back in shape in summer. We play sports, go boating, hike, spend time gardening, and have barbecues. All that summertime action has us in the sun and breaking a sweat. Lemonade and cold beers are refreshing, but summer could also bring about a party crasher called prostatitis. If you find yourself with urinary frequency and urgency, or a burning sensation upon urination, you could be suffering from prostatitis. Men ages 30-60 are at the highest risk for prostatitis, but it is a common urinary tract problem for men of all ages. When prostatitis becomes really bad, you might find yourself getting up six times a night going to the bathroom, or not being able to fully void your bladder. How Does Summertime Fun Cause Prostatitis? In the summer we should be drinking more water because we are outside in the heat, sweating more, drinking alcohol, or spending more time in air conditioning. All of these activities cause dehydration. For example, a 140 pound woman should be drinking 70 ounces of water a day to properly hydrate herself. A 185 pound man should be consuming 90 ounces of water per day to stay healthy. Your body is 65 percent water, and dehydration is triggered when the body loses 1 percent worth of its weight in water. Two percent body weight loss in water can trigger thirst. It is relatively easy to lose that much water on an early morning summer jog. Why Aren’t People Drinking Enough Water? Many people in the United States are consuming less than 12 ounces of water a day. The rest of the water they need is obtained through diet, from vegetables, fruit, and other liquids like tea. Your intestines pull water from your food. The problem with relying on obtaining water through food is you have to eat a huge amount of fruits and vegetables to achieve healthy levels of hydration. The bottom line is that most people are dehydrated. When you are a male and dehydrated, you retain urine in your bladder longer, which causes inflammation in the bladder and prostate. This can also lead to low-level infections in the bladder and prostate. The same is true for a woman’s bladder, and it is thought to be a major cause of urinary tract infections (UTIs). 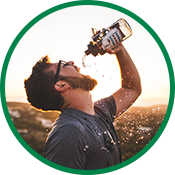 People concerned about prostate health should aim to stay hydrated this summer and make water a preferred beverage. Also, men should consider supporting their prostate health with HP8, a natural health supplement manufactured by American BioSciences, in order to achieve optimal overall health. Shop online with the Harmony Company today!